I bought a Basler Electric B-1823 transformer on Ebay and it arrived Fed Ex over the weekend. Seems to be the heater transformer for large RF vacuum tubes. 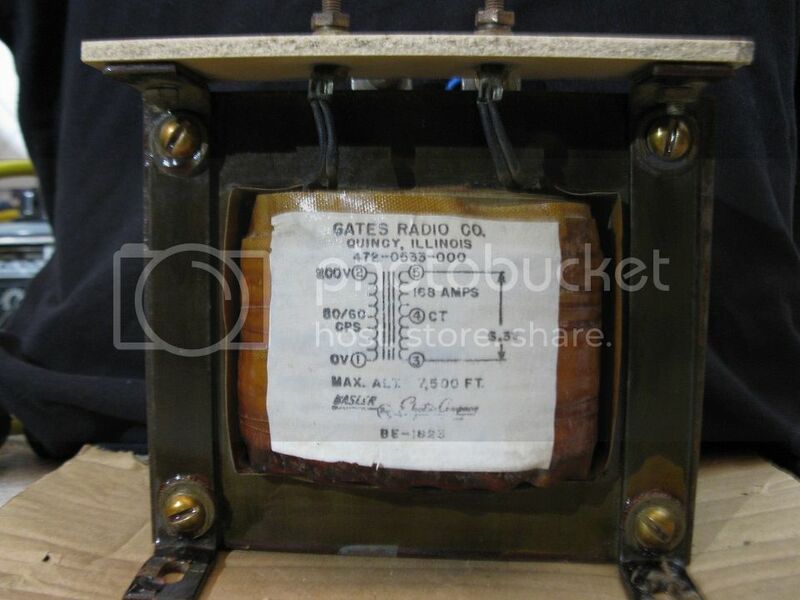 According to the seller, it came out of a 20kW Gates radio set. It's 1kVA, rated output is 6.3V and 168A. Input is 200V, should be ~5A at rated power. For now I'm limited to 140V maximum input. This transformer is no joke. At just 1.5V, shorting a 12 AWG copper wire across it makes the wire instantly hot. At 2.5V the wire is glowing orange hot after one second, and melting after two. I think if I managed to kill it, it would be the primary giving out. It looks like 16AWG. I'm pretty sure it's actually a dual primary as each of the power pins has two wires going to different places. The 200V input is odd, but apparently tube radios like this used a 200V supply for their B+. Since it's rated to handle 200V at 50Hz, I wonder if it would be OK to give it 220, 230, maybe even 240 volts if the line is guaranteed to be 60Hz. The secondary is built of 4 square-section "strands" in parallel, there are at most 6 or 7 turns of it in a single layer. It's center tapped, but the tap wire is only one strand. Maybe the radio used some tubes with a 3-volt heater as well as 6.3 volts. It's rated for 168A continuous. That's a lot of amps. Plenty of 1kVA transformers online but they're mostly 120/240/480 control transformers. I thought this one was pretty interesting since it's 1kVA at very low volts. Little risk of electrocution but definitely a fire hazard! I thought this one was pretty interesting since it's 1kVA at very low volts. Have you heard of rewound MOTs? They're not as well built, but they'll do a few volts at many hundreds of amps as well. A soldering gun is also rated for several hundred amps at under a volt. Nice , I had a Low voltage high current transformer , it was made for 3.6V / 450 Amps continuous on the output with a 240V input . About 25 years ago I took a large 50 amp Variac adjustable transformer donut and used it as the primary without the wiper and wound it with 4/0 copper welding cable, now that baby would warm up nichrome wire at the 12 V output I wound it to produce. Some photos of the unit. It's a Basler Electric BE-1823. It's not the only one of its kind and might not even be terribly rare. Definitely used, but in good shape. Shorting it out is serious business and heats things up quickly. The transformer has so far not complained or even gotten warm, but I haven't dared to short anything above 2.5 volts as the safety measures to handle it aren't in place. It's more of a fire risk than anything. The output needs to be fused if it's to power anything as a short would destroy every conductor involved in the current path. I might look into getting another one. ^Nameplate with info. I'm not sure why it's center tapped. 200V 50/60Hz, since low frequency has the same effect as an overvoltage, I imagine it can tolerate some actual overvoltage provided the insulation can handle it. ( I think it could.) I don't know if I'll actually do it. ^Low voltage side. 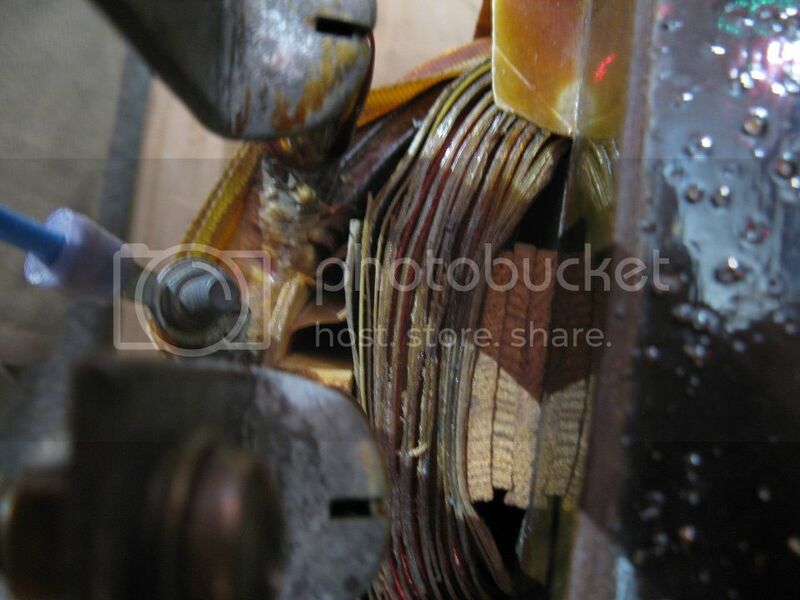 The secondaries are made of thick square wire. ^The primary input pins have two wires attached, going to different parts of the winding. Seems to be twin primaries in parallel. I wonder if putting them in series would allow for 400V operation? ^Close-up of the secondary. I'm not sure what the black substance is, but it isn't burned or heat-related. I imagine it's bitumen or something like it, meant to hold things in place while it's being built. ^Secondaries and center tap. I'm not sure why it would be center tapped, but it was wired to something so apparently it did one thing or another. There you can see the primary windings in between the insulation paper. They might be 16 AWG but it's hard to tell since solid wire is a smaller diameter than stranded for the same gauge. It's thicker than my 5A variac's windings but substantially thinner than the 22A Powerstat. 10A to 15A probably would be ok for short periods, I imagine 20+A could be bad. 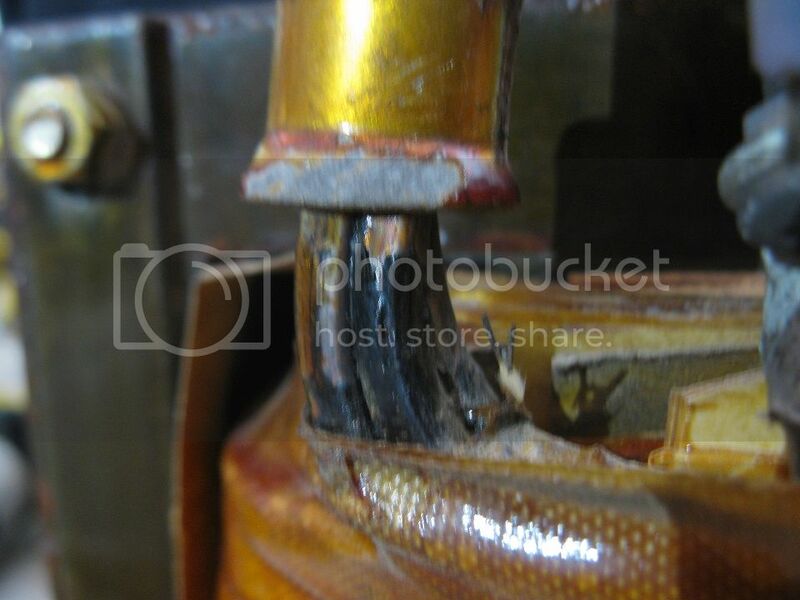 You can see part of the secondary as well, and some of the wood splints that hold things in place. 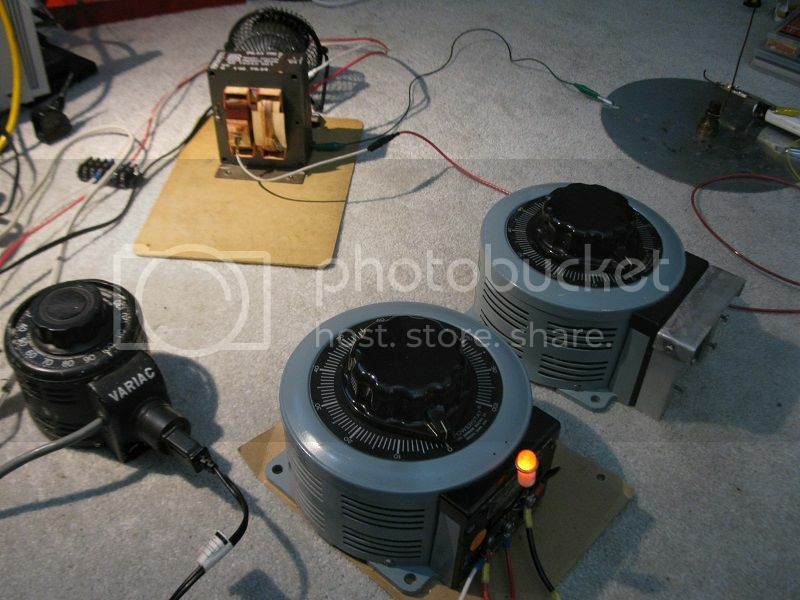 ^At 1kVA this transformer is too much for the 5A variac, but the big Powerstat 136B's are good for 22A (3kVA at 140V). Another Basler Electric transformer is also there. Come to think of it, its primary is about the same gauge as the unit above, and it can make the variac trip a 15A surge protector without getting too warm. Note that's with the variac stepping down (a "120v" MOT should be de-rated to 90v), so if the variac is pulling 15A from the mains the MOT input should be ~20A. Unlike newer MOT's its primary is copper, it does get warm, but at higher input volts (90+) the secondary heats faster. I ordered an AC current meter (20A panel meter) that shows 0-20A and has a 20-40A "overload" area beyond that so I'll be able to get numbers when it arrives. I'd like to melt some things, just not my transformer. 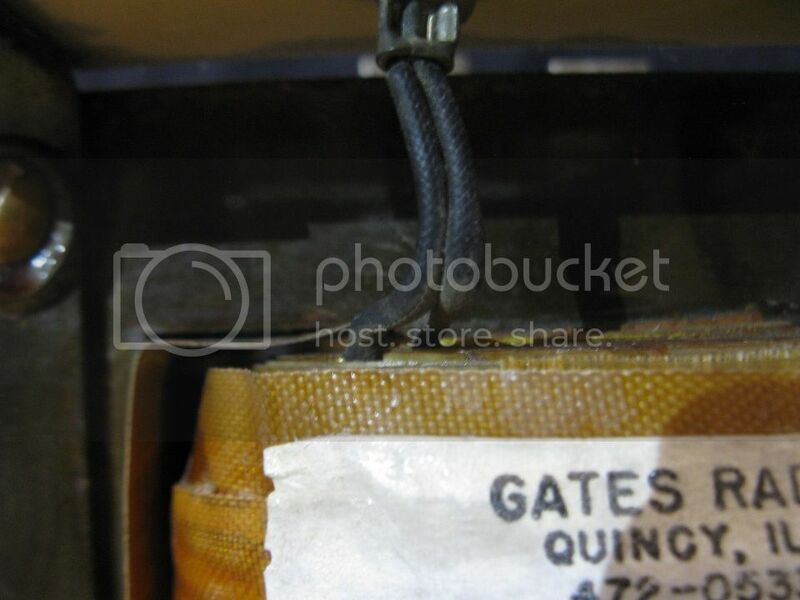 The centre tap would be the ground for the High voltage return as this transformer was made to drive a vacuum tube with a directly heated cathode . Been shorting this out tonight with a section of 3/4" copper pipe. The current output of this transformer is just stupid. At 80 VAC input and dead short on the secondary, it pulls 30A off the variac and the primary winding doesn't even get warm. The secondary winding also apparently couldn't care less that the current ratio is 32 to 1 and it's putting out ~960 amps. The only thing that gets hot is the big blade connectors on the secondary windings. At 1000A they really heat up fast. I can probably heatsink them to reduce current density and use forced air to cool them down a bit. I need to get at least another one of these so I can put the secondaries in series and start my car with it. If I could get more of these than just two, I totally would. This transformer is ridiculously insane. It should be rated 300A out, not 168A. It should be rated 300A out, not 168A. Just because it CAN do 300A doesn't mean it should be rated there. These ratings are continuous ratings. Sounds like you're only running this for a minute at a time. 300A continuous and I can just about promise it will overheat. 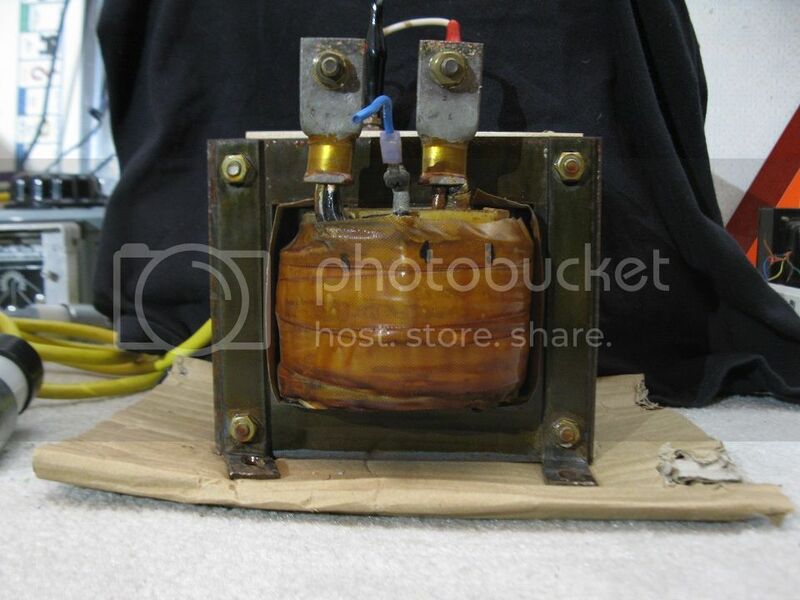 Take one of those Variac transformers apart, use the winding as a primary and wind it with some large diameter copper welding cable and now you are cooking. I built a 200 amp 12 V continuous output transformer that way once. Two of these transformers in series running on a big 240-volt variac would make a fun car starter. Just need a rectifier and a big cap to get DC out. Honestly thinking about building one using my 136B's. The user manual for the 136B includes wiring diagrams showing how to gang them series to allow 240 volt input and up to ~280 volts output. Looks pretty simple, just need to replace the adjuster shafts with a single 1/2" shaft running through both them and a single dial on top. Probably, these things are designed for 365x24 operation in things like radio transmitter stations, even when weather conditions are hot and such. I'm sure it will deliver much more briefly, and could be re-purposed as a transformer for spot welding or something like that. Perhaps it can deliver 300 amps continously in low ambient temperatures, there is no way to tell unless you have the specifications for it. These things were often over-dimensioned by a fair amount so that they could be fit and forgotten about even in remote locations in warm environments. Nice find, I wonder what tube the transformer was designed for? Multiple tubes in parallel? The 833C requires 10v 10A but I notice 6.3v to be a pretty common voltage for filament heaters. could be , or one very large directly heated triode or tetrode . Coud be many things. According to the vendor it came out of a 20 kW transmitter, which could have a single specialist tube, or several tubes operated in conjuction. There are actually some fairly 'standard' tubes that go all the way up to 25 kW output power (4cx25000) with forced air cooling. These thing are huge tetrode tubes and probably still in use in some FM broadcast stations. Something in the order of 180 amps, 6.1 volts filament drive would be consistent with a 20 kW radio tetrode tube. There also is a huge HVDC power supply in these units for the anode side, possibly with an output capability of something around 10kV at 40 amps for a 20 kW output power system. There is no way to operate those hvdc supplies from household current though, they usually are 3 phase powered at significant input voltage (400 volts between phases in europe, not sure what they do in the US). 11 volt filament @ 240 amps. Heck, I built a custom pair of SET monoblocks with a pair of 3CX2500H3. I suspect they may be the world's highest output SET amps. I rated them quite conservatively at 'only' 500 watts each. Good lord those are big tubes. How do I get one to power a larger VTTC?! I suppose if you want more Bang for the buck you build a large SGTC or DRSSTC. A VTTC of that magnitude would be costly. 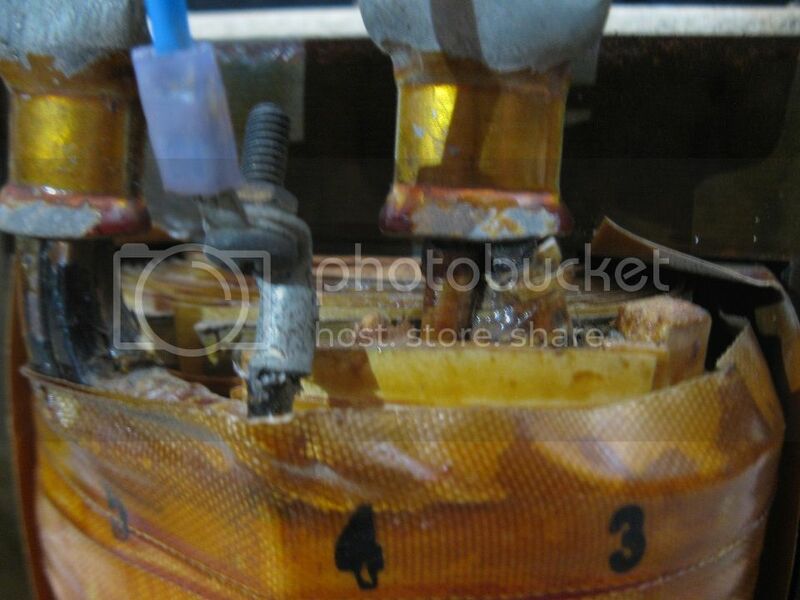 I'm in the market for large transformer I can chop apart to make a large inductive ballests. So, to you my friend if you have no use for the XMFR as is you could always rewind it. Like Cyp. Mentioned.